Whether Manchester City can make an impression in their first European Cup campaign since 1968 remains to be seen, as their city rivals United aim for a fourth Champions League final in five seasons. But in no doubt are the storming starts both clubs have made in the Premier League this season, with United notching a record 18 goals inside their first four games, and City scoring 15 goals, to give them goal differences of 15 and 12 respectively. Both clubs have also notched two hat-tricks already: Wayne Rooney scoring both of United’s while Edin Dzeko (in a four-goal haul against Spurs) and Sergio Aguero have bagged City’s trebles. 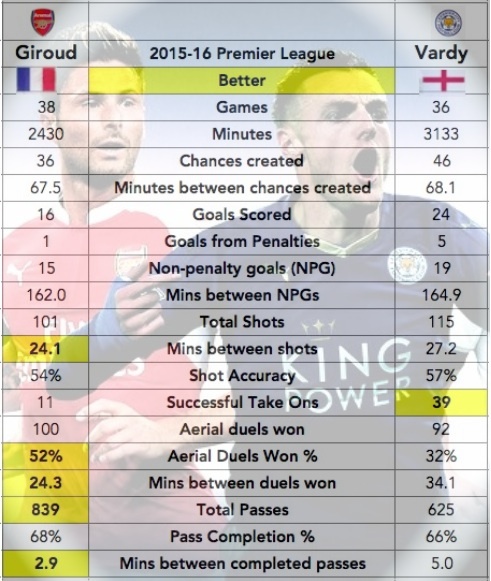 This is remarkable stuff. No other Premier League side has got a hat-trick yet. 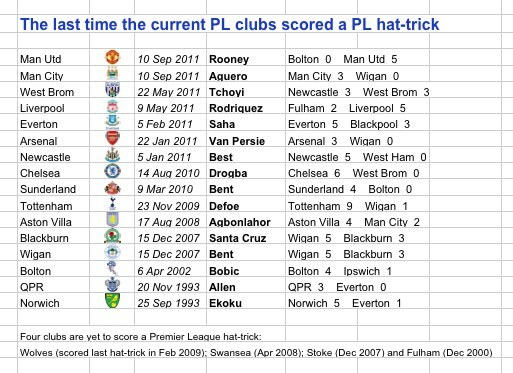 And as recently as five years ago, in the 2006-07 season, there were only three hat-tricks in the whole season by all 20 clubs combined. (The first one that season, incidentally, was score by Rooney at Bolton). 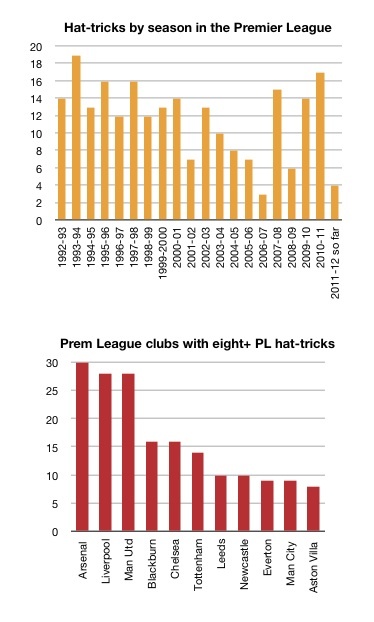 Last season’s total of 17 hat-tricks in the division is the highest number in a Premier League season since the league was pruned down to 20 clubs – thus reducing the number of games by nearly a fifth. That tally of 17 was only bettered once in any case, in 1993-94, when 19 were scored. Manchester is united in bringing goals this campaign. It doesn’t need a statistician to point out that for hat-tricks to be possible teams have got to score at least three goals in a game themselves – and United and City are delivering consistently. In 39 Premier League games (involving all clubs combined, hence 78 sides contesting fixtures so far), only 11 of those 78 teams have managed three goals or more. On four of those occasions, City have scored at least three goals, namely in all their four games. And on three occasions, United have scored at least three goals, namely in three of their four games. The only other clubs to have scored three in the same game so far, and then only once each, are Aston Villa, Bolton, Chelsea and Liverpool. United, not renowned for hat-trick scoring in the early Premier League years, have now scored 28 since 1992, which places them level with Liverpool’s 28, and only two behind Arsenal’s record of 30. Rooney is now up to six hat-tricks in the Premier League, which puts him in fifth place in the PL hat-trick table behind Alan Shearer (11), Robbie Fowler (9), and Thierry Henry and Michael Owen (8 each). 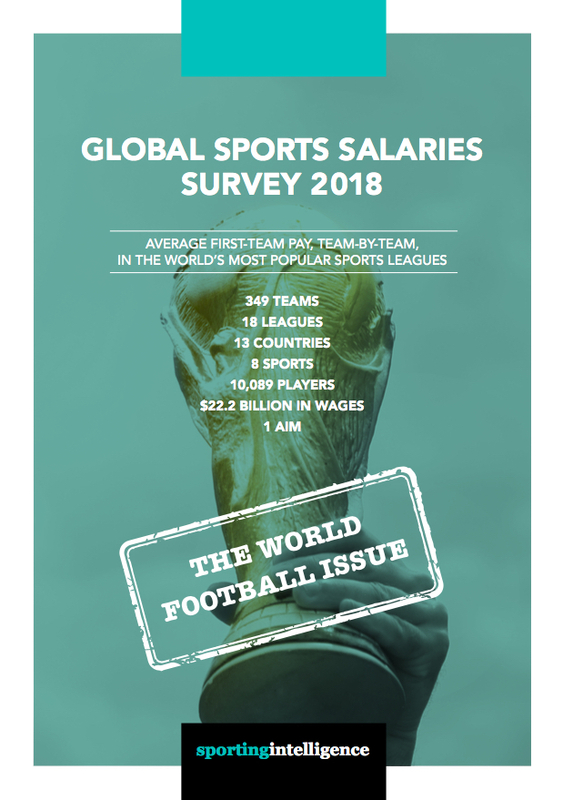 As our table below shows (scroll down), seven current Premier League clubs have notched at least one hat-trick in this calendar year, but Chelsea fans have waited more than a year since their last treble, Tottenham fans have been waiting nearly two years, Villa fans more than three years – and Blackburn and Wigan fans almost four years. Rovers and Wigan’s last trebles came in the same game against each other, a 5-3 win for Wigan in December 2007.